The Italian legend Maurilio De Zolt and Norwegian great Hilde Pedersen are excellent examples of elite cross country ski racers who continued to excel at the international level into their 40’s. While continuing to compete on the World Cup circuit at that age may not be common, cross country skiing is known for its athletes developing later than in other sports. Top skiers often continue to be competitive through their late 30’s. The graph below shows the results for distance events, broken down by gender. Each point represents the average FIS points for a season by an athlete of the given age at the start of the season. (Ages are somewhat approximate, as I only have access to the year of birth. This means the actual ages will vary by around +/- 6 months.) Additionally, I’ve added a trend line to each panel. Several things immediately stand out. First, there is the general downward trend over time. Skiers improve over time! Shocking! Actually, part of what is going on here is selection bias. If you’re over the age of 35 and still skiing WCs or OWG races, chances are you’ve proven yourself as an elite competitor. So at the far right of these plots, we’re primarily seeing the effects of other, slower skiers retiring. 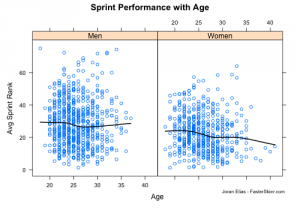 If we allowed these slower skiers to continue racing into their late 30’s it’s likely that both trend lines would start to slope up slightly by age 40. More interesting are the differences between the panels representing men and women. For men, we see steady improvement until around age 30 and then things begin to plateau. For women, the improvement early (<24) seems slightly slower than for the men, and then suddenly drops down between the ages ~24-28. From there the downward trend continues, but more slowly. Additionally, there appears to be less of an attrition effect for women. 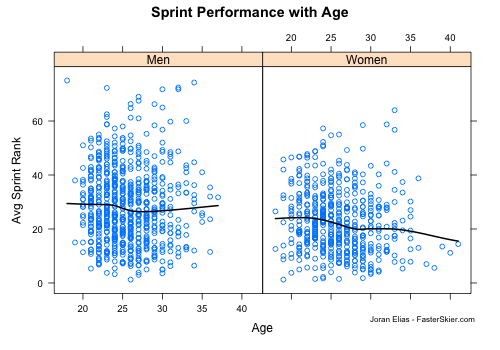 Notice how the pattern of points in the men’s panel steadily narrow like a funnel as we move right, while in the women’s panel even at age 35 there’s still a wide range of performance levels. It seems that if you’re a man and still racing World Cups past the age of 35, it’s very likely that you are very, very fast, while if you are a woman, it may be possible to continue racing past the age of 35 without being quite such a dominant skier. Why would this be the case? I’m not sure. Perhaps come commenters will enlighten me! Actually, I’ve changed things slightly. I’ve included seasons with as few as four sprint races rather than five. That increases the number of data points we have to work with, which is helpful since sprinting hasn’t been around nearly as long and so the data here are more limited. First we should note that the five points in the lower right in the women’s panel are certainly having a disproportionately large effect on the trend line. Without these points, the trend line would likely remain mostly flat through the late 30’s. Also, I’m not sure how significant the slight upward trend in the men’s panel is. Again, there isn’t a lot of data there, so I’d read that as “mostly flat” rather than “slightly up”. One similarity, for the women, is the trend from ages 24-28. As with the distance events, that seems to be where women make their largest improvements. I don’t have a great ending for all this, so instead I’ll just invite you to discuss and comment away…and I’ll close with a trivia question: Can you name the (retired) skier with a FIS results record whose entire name consists of a single letter? Posted by Joran on Saturday, May 1, 2010, at 9:29 pm. Filed under Analysis. Tagged Age, Analysis, Distance, Sprint. Follow any responses to this post with its comments RSS feed. You can post a comment or trackback from your blog.